OWH not only lets you share all of your ideas as simple web pages, but lets others link your ideas into their workspace so you can collaborate on an idea with as many people as you like. To share an idea, change it sharing settings. In the workspace, you can open an idea's settings screen by double clicking on that idea. This is the default setting when you create an idea. Each idea has a URL where it is viewable as a web page but for this setting, the page is only viewable by you, when you are logged into OWH. This is useful for previewing a page you don't want to make public yet, but want to see how it will look. There are no social media sharing options available when this setting is in effect because nobody else would be able to view the shared URL. If you don't ever want to share your ideas, you can just leave the default enabled and ignore this setting, nobody else will be able to see your private ideas. You can share these links via social media or link them from other pages. This is the setting you usually would choose when publishing something. In the 'Public' example, someone could probably guess what the URL is, if they knew your username and knew you were writing about boats. With obscure URLs turned on, the URL is much harder to guess, so only people that have gotten the URL directly or indirectly from you will be able to find this page. We also ask search engines not to index pages with the obscure setting enabled. For any shared idea, Orbital WareHouse tracks how many times that idea's page has been viewed, as well as the last time that idea was modified and displays it in the page footer. 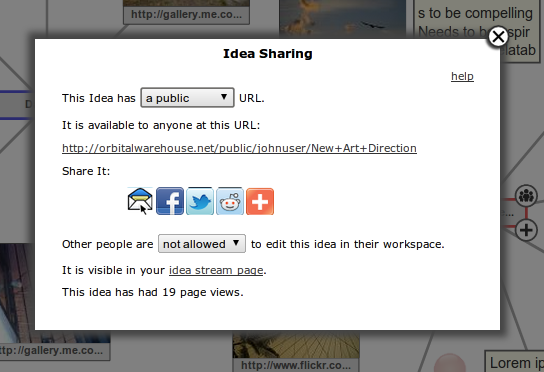 Once you've shared an idea, you can also control whether other users are allowed to edit your idea. You can use this to colloaborate with other people. Changes other people make to your idea will appear on your workspace a few seconds after the change has been made. Ideas that are allowed to be modified by other people will appear green on other users' workspaces after they have linked your shared idea. Ideas that are not allowed to be modified will appear as red. To allow other users to edit an idea, click the dropdown menu in the sharing settings screen and change 'not allowed' to 'allowed'. At the bottom of every idea's sharing page, there is a counter that shows how many times that page has been visited. It's useful for determining how popular your shared ideas have been. The number is updated each time somebody loads the page and is only reset if the idea is deleted and recreated with the same name. Note that the counter will also be updated when it is visited by search bots and other automated processes on the Internet. This page has been viewed 1332 times since it was created. Last modified 06:35 - 25/11/2012.